Police have identified the suspected gunman who shot six people – killing one of them – in Mesa, Arizona on Wednesday as 41-year-old Ryan Elliot Giroux, a man with a criminal record and alleged connections with neo-Nazi and white supremacist groups. Giroux was taken into custody by law enforcement after allegedly conducting a deadly shooting spree at multiple locations in Mesa, during which one person died and five were injured. The incident triggered an hours-long manhunt that ended after police tased Giroux and he surrendered, CBS News reported. Previously, the Arizona Republic reported that an anonymous police source identified Giroux as the suspect. A spokesperson for the hospital treating the suspect, Banner Desert Medical Center, confirmed to the newspaper that a man with the same name as Giroux was treated and released to police at 2:30 p.m., though no further details were given. Nonetheless, multiple media outlets are reporting noteworthy information about the man’s past. He has served time in prison for multiple crimes, including burglary, attempted aggravated assault and marijuana possession. He served more than six years behind bars for the aggravated assault charge and was released in 2013. During the manhunt Wednesday, police said they were looking for a bald man with tattoos on his face and neck. Photographs of Giroux from the Arizona Department of Corrections show that he has the word “skinhead” tattooed just above his eyebrows, along with the number “88” – used as code to for the ‘Heil Hitler’ salute. Other tattoos include one across his neck and another on his chin. According to the Republic, Giroux started having some of his tattoos removed after he left prison in 2013. He has seven felony convictions on the record, including convictions in Arizona, California and Washington. Additionally, retired Mesa Police Detective Matt Browning told the Southern Poverty Law Center’s Hatewatch blog that Giroux was a member of Hammerskin Nation, a violent and racist skinhead organization. He also associated with the Aryan Brotherhood prison gang, Browning said. 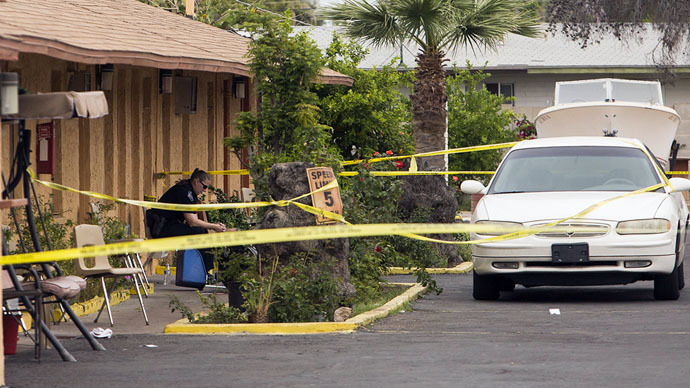 According to the Associated Press, the shooting spree in Mesa began at a local motel, where Giroux reportedly shot three people, killing one of them. Police said the confrontation started as an argument and escalated from there. He then moved onto a nearby restaurant, where another individual was shot. Giroux then allegedly stole a car and shot two other people at separate apartment buildings. Mesa police spokesman said that officials believe Giroux is responsible for all the shootings, according to Reuters.